Discussion in 'Gen 2 Prius Care, Maintenance and Troubleshooting' started by prius_nerd, Feb 11, 2019. I have a 2008 Toyota Prius. Neither mentions synthetic oil at all. The Scheduled Maintenance Guide recommends changing oil and the filter every 5K miles but is probably talking about standard dinosaur oil. Advance Auto Parts - Down for Maintenance says "The special synthetic oil used for Toyota and Jaguar vehicles has been approved for change intervals of 10,000 and 15,000 miles respectively" . Are you changing your oil too often? - Chicago Tribune says "Toyota says if you use full synthetic oil, it's a 10,000-mile oil change interval." Stop Changing Your Oil! &amp;#124; Edmunds.com says "Toyota has been shifting its fleet to 10,000-mile oil change intervals using synthetic oil." How often do you change your oil? | PriusChat has a bunch of anecdotes, which are better than nothing, but I'm wondering: can you point me to an official recommendation either from Toyota or from an oil company that specifically mentions Prius? Oil deteriorates slowly; it's not fine, fine, then suddenly not fine. Your call when you want to change it, depends on your priorities, how long you plan to keep it, whether you DIY vs the hassles/expense of pro oil changes. If you want to baby it change it earlier, and check the level regularly as well. Personally I change per my Canadian 2010 Owner's Manual, which specs 0W20 (invariably synthetic I think), and 6 months or 5000 miles whichever comes first. prius_nerd and JC91006 like this. The official recommended oil change interval is 5000 miles, I doubt Toyota would ever change that. Oil is always getting better. Oil that was used in the 70’s would ruin an engine today that’s the nature of improvement. The only time I have seen then change a fluid recommendation is backwards. They used to say their transmission fluid was lifetime. Now it’s less, like 90,000? Miles? What are the oil change intervals using synthetic oil? per my Canadian 2010 Owner's Manual, which specs 0W20 (invariably synthetic I think), and 6 months or 5000 miles whichever comes first. I have never been able to understand what is so different about the NA market. Is it just greed on the part of dealers, is the oil inferior? Was there some law suit and so now they just are covering their butts? Here, Australia and UK (and maybe Europe, too??) 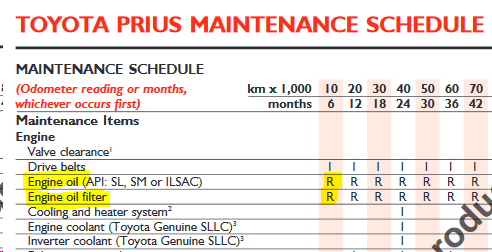 Toyota specifies 15,000 km/1 Year (or 10,000 mile/1 Year for UK). 15,000 km is the metric equivalent to 10,000 miles (given that 10,000 miles is 16,093 km, rounded down to make a better number to work with). My cars have always had 15,000 km and oil is not that black, but I use full synthetic and a new oil filter each time. Never had a problem. I'd looked up third gen AUS schedule before, and it was saying 6 months or 10,000 kms for oil and filter. Checked 2nd gen and it was the same. These are just pdf's, maybe you booklet is different? I'm DIY'ing the oil, the cost is trivial, and I really don't mind overdoing it. I appreciate it's more hassle and expense going through dealerships though. It's fun and interesting to compare notes with others on this topic. Here is my experience in the post I copied below, I used to change our oil every 3000 to 5000 miles but in the last 5 years have finally been converted. I drive a 2004 Sienna LE and 2008 Prius. We bought them new and I used Mobile 1 synthetic 5w-30 initially and changed oil out at 5000 miles with a new filter. I have changed this habit. After many years of doing this and becoming price sensitive. I've switched to dare I say it, Walmart Super Tech synthetic 5w-30 and change it once a year (in miles driven this works out for us to be about 10,000 to 12,000 miles). I use Purolator Pure One oil filters and change the oil filter every 6 months. Our engine seems to have not noticed the change and I feel confident enough in this 14 year old vehicle to take trips like a 3500 mile round trip from Kentucky to South Dakota/Wyoming this last summer. Driving 80 to 85 miles per hour in South Dakota and parts of Wyoming where the speed limit is 80 miles per hour. This seems to be working for us with savings of about a $5-$10 by watching the price of Walmart Synthetic and another $25 savings by changing out the oil every 10,000 miles instead of 5000 miles. This is something I have now been doing for the last 5 years. I have gained enough confidence is this routine that I now use Walmart Synthetic and Purolator Pure One filters in our 2008 Prius doing the same 10,000 to 12000 mile routine. Our Prius seems satisfied still turning in right around 50 mpg. prius_nerd and Mendel Leisk like this. I was getting Toyota Bulk 0W20 for $4.50 (CDN) per liter, went up recently to $4.90. For our daughter's Pilot I get Toyota bulk 5W20 (conventional) for $2.80 per liter. Show up with a 10 liter gas can, transfer to 4 liters bottles if I need to, when I get home. The price is very reasonable, and I don't need to chase sales. Also, I avoid putting all those bottles in the recycle stream. prius_nerd, exstudent and John321 like this. That sounds like a great way to get good oil at a good price, I think I will check our local dealer for this option. I suspect I'm their only client for this, not sure. Yeah it'd be good if it caught on. I contacted the service manager a few years back, asked about it and he ok'd. Their service department mainly uses bulk oil, and it's good for a lot of reasons. People get paranoid about it not being the same oil since they don't see the branded bottle, but I think we've just gotta get over that. You do realize, most manufactures of late model cars (say 2010 and later) specifically advise the motor oil to be a quality synthetic, and for a much longer mileage service interval? Some some manufactures go to 5k, 7k, 10k miles, and beyond. Remember, the auto manufacutres have done some expensive testing and would be on the hook for an insane amount of warranty claims if they got their extended service interval wrong. Remember the Gen 2 is speced for conventional motor oil at 5k mile intervals. Obviously you can run synthetic in a Gen2, but Toyota didn't provided an oil change interval when running synthetic. Logically you can go longer, and many people have done so w/o any problems. IIRC, PC's own Patrick Wong did go 7,500 miles between oil changes w/ synthetic, when he had his Gen2. The Gen3 is speced for synthetic motor oil and 10k mile oil change intervals. I have never been able to understand what is so different about the NA market. People not wanting to accept responsibility, that they are actually at fault. Was there some law suit and so now they just are covering their butts? Toyota settled this costly Class Action case. And because of it, they went w/ shorter oil change intervals for a period of time, to minimize/prevent future class action lawsuits due to oil sludge. You are a responsible owner who keeps up on the oil change interval. I do agree w/ Toyota's position that owner's poor maintenance was the cause of the sludge. Large bulk oil's cleanliness cannot be controlled as its transferred from a dirty tanker truck or from point of origin. Lots of transfer's from manufacturer to the nasty tank at the dealer. And Large bulk storage tank at the dealer is never cleaned. Never. Not many reasons why its good except your buying it in bulk so its a little cheaper and with pneumatic injector (another way to induce dirt as that's never cleaned either) its fast to install but not accurate at all which is why so many people get drastically overfilled at the dealer. There's no guarantee of what brand it is or what viscosity it is. Toyota says nothing about synthetic oil in the Owner's Manual. An argument could be made that spec'ing 0W20 infers synthetic, but nowhere do they make a connection between synth oil and longer service interval. Correct about the inference. As you know, 0W-20 is only available as a synthetic. Therefore synthetic oil only. Gen2, 5W-30 (conventional), 5K mile OCI (oil change interval). Gen3/4, 0W-20 (synthetic), 10K mile OCI. Notice the longer OCI, due to the change from conventional motor oil to synthetic. Volumes of data about extended OCI when using quality synthetic motor oil and quality oil filters. Up to the individual to go long or short. Their car, their money. For my Gen 3, with 0W20 Toyota Canada says 6 months or 8000 km (~5000 miles), whichever comes first. For Gen 4, essentially the same engine and 0W20 again, they're in line with the US schedule: 12 months or 16K kms (~10K miles). I just go with the 6 months interval, our kms are extremely low (almost into severe service due to short trips), and if I had a Gen 4 would likely do the same. 2007 Prius Ran out of Gas :( and drained battery. How to get prius to shut engine off more often (use battery to propel)? How often to Prius inverters need to be replaced?